Mutant Chronicles RPG In Stores NOW! 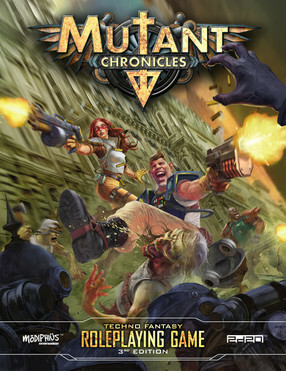 The Mutant Chronicles RPG, Players Guide and Collectors Edition are in stores NOW – Get your Techno Fantasy on! London 20th November – Modiphius, the creator of acclaimed table top and roleplaying games like Achtung! Cthulhu and the Thunderbirds board game, is proud to announce the release of The Mutant Chronicles Dark Symmetry Core Book, an exclusive Core Book Collector’s Edition and The Mutant Chronicles Player’s Guide. It’s a trio of releases which gives players everything they need to explore this dark, unsettling universe, where the solar system is riven by war, corporate intrigue and vicious infighting in the face of a vicious Dark Legion invasion. The Mutant Chronicles Core book is available from Modiphius in both Print and PDF and exclusively as a Collector’s Edition or from DriveThruRPG.com. 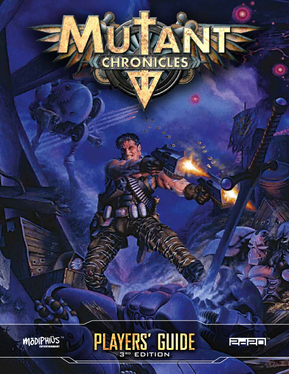 Mutant Chronicles, created by Paradox Entertainment was one of the biggest names in gaming in the 1990s with the Doom Trooper collectible card game translated in to 16 languages, three boardgames, a SNES and Mega Drive Doom Trooper video game, a massive Warzone miniatures game and the hugely popular Mutant Chronicles 1st and 2nd Edition roleplaying games. Now, with this new release of this 3rd Edition of the Dark Symmetry Core Book you can play during the early days of the Dark Symmetry, through to the brutal Corporate Wars in the definitive techno-fantasy roleplaying game. Mutant Chronicles takes you on a full – throttle diesel-punk ride though a solar system beset by corporate intrigue and the invasion of the Dark Legion. With technology failing due to the insidious effects of the Dark Symmetry, mankind must fight back against the Dark Legion hordes whilst dealing with in-fighting and conspiracy. Investigate foul cults as technology turns against mankind, or fight the armies of the Dark Legion as they pour forth from citadels across the colonies the battle for humanity’s future. Complete 2d20 game system, including detailed character creation and cinematic roleplaying, plus full rules for spaceships and vehicles. Never-before seen secrets of the Mutant Chronicles universe, and maps of the solar system and Luna City. Insights into the Dark Legion Apostles and their unique forces, tactics and plots along with full stats for new and old monstrosities. Briefings on the major corporations, Imperial, Bauhaus, Capitol, Mishima, and Cybertronic, as well as Cartel, the Brotherhood, and Whitestar. Guide to running adventures during the rise of the Dark Symmetry and the first wars through to the return of the Dark Legion. 496 pages of techno-fantasy adventure in the Mutant Chronicles universe! A special limited edition Dark Symmetry Collector’s Edition only available on Modiphius.net features a highly desirable leather effect cover, embossed with the Brotherhood symbol. Hot on the heels of the Dark Symmetry Core book comes The Mutant Chronicles Player’s Guide, with content drawn from the 3rd Edition Core Rulebook, and containing everything players need to create characters in the Mutant Chronicles universe, as well as an introduction to the 2d20 game system. Detailed Skills and Talents chapter for in-game reference. Character Sheets (including Lifepath worksheet). Short and Long term experience and gameplay rewards. How to use Momentum and Chronicle Points to boost your game. Weapon and armour tables to get your character ready for action. These three brand new releases form the core of the Mutant Chronicles universe, with further releases already planned in for early 2016 including special supplements for all major corporations like Capitol, Mishima and Brotherhood, plus further accessories in the Mutant Chronicles range like custom dice sets and GM screens. A dark universe of high adventure awaits! Size: 116 Page full colour US Letter size. I’m digging the Mutant Chronicles as D20 System. We’ve written about it’s sister game Warzone Resurrection before. So any chance I get to dive further into the fray of the Mutant Chronicles, I’m always up for!